This combi carp rig lies much straighter and looks better when a safety lead clip is used. The lead clip allows the lead to sink a little into the silt without dragging parts of the stiff boom with it. The effect is, the whole combi rig lies nicely on the top of the silt. Although, this bait presentation can work on silt, I still prefer to use a coated braid hook link and strip away an inch by the hook. I use a more supple type of coated braid on silt rather than a stiffer version because it has less chance of the rig landing kinked up in the silt. A heavy, supple coated braid will still drop to the bottom without leaving a big loop in the hook link where any carp can clearly see it! When presenting a bait on silt, use black mono fishing lines for combi carp rigs rather than fluorocarbon. 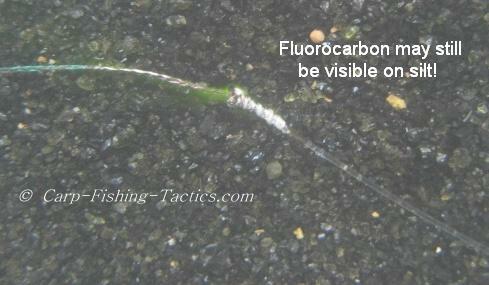 The clear mono fishing lines can still show up clearly on silt!